If true, it's a welcome change. The fact that copyright infringement of “Hollywood” (AFACT) films occurs should not necessitate or compel imposing an obligation upon ISPs to become unpaid “Hollywood” copyright police, merely because they feel something must be done to stop the infringements. As AFACT have chosen to redefine civil copyright breach as “theft” (their chosen name! ), let them fund their own civil copyright theft police. They cannot expect the law (which until now has recognised no positive obligation on any person to protect the copyright of another) to impose commercially burdensome obligations upon an industry that is lawfully providing a communication service. Disclosure: I have been a happy iiNet customer for 8 years. 7/13/2011,18:00,19:30,"Cisco Burger Maker cannot make burgers"
You might comment "that eventDescription looks normal, but what kind of silly notation are eventStart and eventDuration in?!" It's ISO 8601 which is the standard for interchange of date and times. 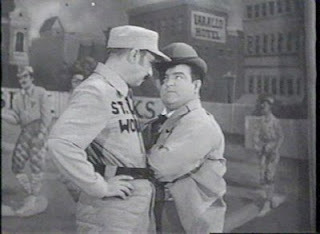 It's commonly used in XML documents prevent a Abbott and Costello "Who's on first?" ambiguity when representing date, time and duration. "One second? No, I need you to tell me the duration now!" The XML contains the eventStart and eventDuration, but no end time. To produce the output I need, I'm going to need to do some date manipulation. This would be easy enough in any other languages: Java and C# have classes that deal with date manipulation. Unfortunately, XSL isn't as flexible. To do the sort of transformations requires to get the output, we'll need to do a bit of string hacking. To ease the string happening, I've expended all my photoshop skills to produce this diagram that shows the character positions. I installed Photoshop for this?! 1) How do you convert an ISO 8601 date to DD/MM/YYYY? We can do this with simple string manipulation. Because ISO 8601 requires padding of date variables (ie. the Queen's birthday is stored as 2011-06-13 and not 2011-6-13), we are guaranteed that that the first four characters are the year, the 6th and 7th are the month, and the 9th and 10th are the days. You can use the substring command to grab the right characters, some / characters to separate them, and the concat command to glue it all together. Using that operation could result in the output 02/05/2011. What if we want to drop the preceding zero (ie. get 2/5/2011)? The number function does that. 2) How do you get the time from an ISO 8601 date? This can be performed with easy string manipulation. We can use substring to grab all the five characters after the T and stick them into a new variable called start-time. Applying this to 2011-06-13T18:30:00 gives 18:30. 3) How do I convert an ISO 8601 duration into a 24hr duration? For the purposes of simplicity, I'm going to assume that your periods contain only hours ('H') and minutes ('M') (ie. your period will either be in the form PT30M, PT1H, PT1H30M). No days/weeks/months/years. To do this, I'll create three variables. 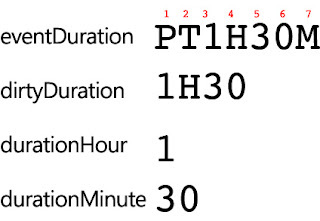 duration-dirty will contain the duration in ISO 8601 format, except with the PT and M characters removed. I'm using this variable to reduce the amount of substring and translate functions in the later code. Here's a diagram that shows these variables relation to the original eventDuration element. To get dirtyDuration, we can use the substring functions to perform some slicing and dicing. To start, we can get rid of the PT and M characters. Once we've done that, the period will look something like 30 (30 minutes), 1H (1 hour) or 1H30 (1 hour and 30 minutes. We can determine whether the duration contained hours by converting the duration-dirty variable to a number. If the conversion outputs NaN (not a number), we know there were more than 60 minutes in the duration. Calculating the minutes is same same but different: we check if the duration-dirty element can be converted to a number. If it can, then dirty-duration contained only minutes (so we can use it). If converting it to a number returns an NaN, there were hours so we need to grab everything after the H.
4) How do I add times together? Suppose we want to calculate the end time of an event given eventStart and eventDuration. Step 2 will give us 18:00 from 2011-07-13T18:00:00. Step 3 will give us the variables duration-hour and duration-minute (1 and 30 respectively). But how do we add these two? Start by calculating the end hour. If we add duration-minute to the minute digits in start-time and exceed 60, an hour has passed. And if we have more than 24 hours...go back to zero using the modulo function! The modulo function is sorta like the the math equivalent of word wrap: 22 mod 24 = 22, 23 mod 24 = 23, 24 mod 24 = 0, 25 mod 24 = 1. Perfect for 'resetting' back to 0. Awesome! But...if you have less than 10 hours, your output won't look pretty (ie. we want 09:30 rather than 9:30). We can easily fix this by padding a zero character if the hours are less than 10. Good. Now calculate the end minute. I'm no physics major but if I recall correctly, there are only 60 minutes in an hour. If there are 60 minutes, the hour increments and the minutes reset back to 0. Awesome! This code assumes that your event starts and ends during the same day. I'll leave incrementing the day as an exercise for you. Not because I don't know how, but because my '<' key is playing up! How do I get a Cisco Nexus 1000v license? Where is the Cisco Nexus 1000v licensing portal? The Cisco Nexus 1000v licensing portal is difficult to find. Here are the links you’ll need to download and activate your Nexus 1000v licenses. Cisco Product License Registration Portal – go here to generate a Nexus 1000v license. You will need a PAK (Product Activation Key) and a cisco.com login to perform this action. Cisco Nexus 1000V Switch Download – you can download the latest Cisco Nexus 1000v here. The latest release at time of writing is 4.2(1)SV1(4). I think Cisco should adopt Apple versioning.